I just watched a great episode of "Mythbusters", which showed how dropping Mentos candy into Coke within seconds causes a shower of soda to spray up to 20 feet in the air. It had to be one of the funniest things I've ever seen. "There's a cascade that happens with -- it's a little esoteric -- an ion exchange. Basically the Mentos start to dissolve, and it's like tripping a switch. It's not what you would call a chain reaction, because that's something else in chemistry terms, but it's a cascade whereon all of a sudden, all of the CO2 that was contained in the liquid is suddenly not as attracted to the liquid as it was before, because of this slight change in the chemistry that occurs. "I took a big swing and popped a couple of Mentos in my mouth, and the soda pretty much came out my nose and sprayed all over the place. Everyone laughed. I've got this big mustache -- it's kind of my trademark on the show -- and it was dripping all over off this mustache and made a big mess. "Just drink the soda and enjoy it, and then eat the candy some other time." The experiment has had one lasting effect on the "MythBusters" team. "We've had cases of Mentos around," Hyneman says. "We're kind of addicted to them. They're hanging out on the tables while we're running around, doing our experiments. They're quite tasty, yeah." 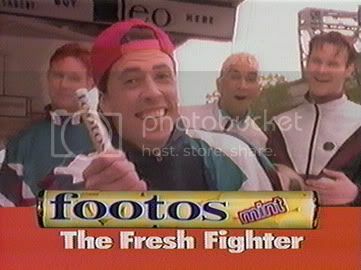 This is bound to cause the biggest boost in the sale of Mentos since that really gay Foo Fighters video.